Cranachan is decadent and delicious yet it is made with only a few simple ingredients and requires very little effort to make. The rich cream is perfectly balanced by the slightly tart raspberries, with toasted oats and nuts giving textural interest. The booze really rounds it out and just makes it perfect! I was looking forward to making Cranachan for Scotland’s Saint Andrew’s Day (30 November) as it was a chance to use steel-cut (pinhead) oats. I have never eaten steel-cut oats before and I was intrigued about how something that looks as appetising as horse feed could be used in a dessert. Disappointingly, they are completely unavailable at the moment! From what I have read steel-cut oats have a slightly chewy texture. Since I had to use rolled oats I added some toasted hazelnuts for extra crunch. The oats will soften after being added to the cream so it is best to assemble this dessert just prior to serving. However all of the elements can be prepared ahead of time so it still has great potential for a dinner party. What is your favourite dinner party dessert? Place the frozen raspberries and sugar in a saucepan and cook until the raspberries have defrosted and start to collapsed. Continue cooking on a gentle simmer for another five minutes. Press through a sieve to remove the seeds. Leave in the fridge to cool. Place the hazelnuts in a dry fry pan and heat until the nuts are golden. Remove from the pan and finely chop. Meanwhile, add the oats to the frypan, stirring occasionally, until lightly toasted. Reserve some of the nuts and oats for garnish. Mix the cream, Drambuie and honey in a bowl, then whip it to soft peaks. Fold through the the nuts and oats. 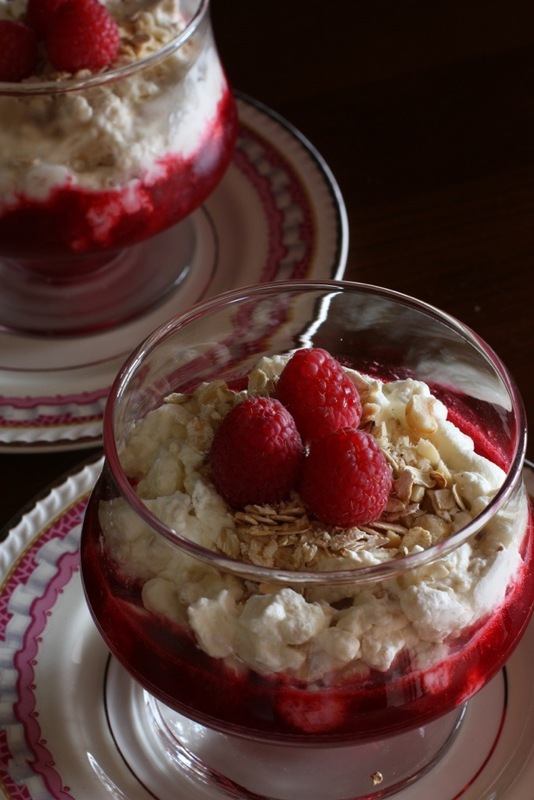 Layer the raspberries and cream in a glass bowl. Garnish with the reserved nuts and oats and fresh raspberries. Serve immediately. Posted in Puddings & MoussesTagged Delia Smith, Drambuie, easy cooking, easy desserts, egg free, food, food photography, Nigel Slater, oats, Scotland, vegetarianBookmark the permalink. I’m wondering how to pronounce this dessert. I was a total failure in Scotland. 🙂 It sounds really good. We can get steel cut oats here in Australia but honestly I can’t see that they’d be any better than what you made. I’m not sure about the pronunciation either! I think it’s “kraneshan”. It was absolutely delicious but I will have to make it again with the steel-cut oats just to compare. It’s important to be thorough! That looks pretty appetising even though I don’t really like things with cream! I wonder if you were watching the calories could you substitute with organic yoghurt? I don’t overly care for cream either, but I really enjoyed this. My cranachan recipe is relatively “light”; some recipes used double cream! The raspberries are a little tart, so if you were to use yoghurt it would have to be a sweet type of yoghurt. Despite my Scottish heritage (my Grandparents on my Mum’s side are Scottish) I’ve never heard of this. I wish I had because it looks divine. I adore cranachan – the combination of cream, fruit, oats and a nip of booze is just delicious!